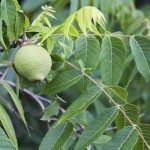 Can rhododendrons grow around black walnut trees? 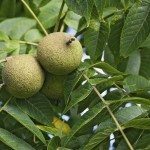 Black walnut trees have chemical properties in leaves and roots that can suppress the growth of other plants. This is called "allelopathy". Some plants are more susceptible to the allelopathic effect from black walnut than others, rhododendrons (including azaleas) are known to be affected.